Dee David & Co. LLC, (VA) - Press Room, Magazines Articles, Helpful Links, Client Testimonials, Fall Church, Virginia. Dee David was inducted into the NKBA Hall of Fame in 2004. The National Kitchen and Bath Industry Hall of Fame honors individuals for their remarkable contributions to the advancement of the kitchen and bath industry through their innovation, leadership, and commitment to excellence, and who have showed extraordinary dedication to the kitchen and bath industry as a whole. Dee won National recognition from the Sub-Zero Wolf Corporation for, best use of Sub Zero and or Wolf in an outdoor kitchen in the 2006-2007 Sub Zero Wolf Corporation Design Contest. Plain n Fancy Cabinetry was selected for the Coastal Living Idea House in Norfolk, Virginia and Dee David was selected to assist in the design and layout of the cabinetry for the kitchen. Experts for Kitchen and Bath Design. When the kitchen and bathroom were finished we were completely overwhelmed and exhausted. The new spaces were clearly beautiful, but it wasn’t until we had been using the spaces for several weeks that we came to appreciate not only the design but the functionality as well. In fact, I love some things much more than I thought I would have, like the hot and cold filtered water spouts. I use them throughout the day. You said we would love the smaller dishwasher, and we do! We are still exploring the Advantium and finding great features all the time. My bathroom is so nice to spend time in. The medicine cabinets are perfect, and I’m glad I opted for the 6” depth. The Hansgrohe showerhead is a treat. It’s like standing in a warm, gentle rain. The floor is both stunning and warm. I love it. We purchased our home in 2007. It was constructed in 1959 and had some remodeling work done over time. The kitchen was a galley style and had been updated with appliances and countertops sometime before our purchase. (We believe the cabinets were original). While the kitchen was serviceable, we are a family that loves to cook and cook together and the kitchen just didn’t work well for us. The oven/range had a small cook top that did not accommodate our cookware. Also, the kitchen did not have an exhaust fan. The oven was a single oven below the cook top which meant the cook at the range had to move when things came in and out of the oven. There were also some odd spaces and the refrigerator was placed such that the door did not open completely. Also, the dining room was a narrow space with a wall between the kitchen and dining room and open to the living room. When we bought the house the real estate agent said the dining room was one of the limiting factors to the house. We started working with Dee David & Co. and Arant Construction in January 2011. Our goals were to have a kitchen that married functionality and design. We wanted plenty of space for two cooks. While the team provided us with some designs that did not require major construction, we ultimately went with a plan that required bumping out six feet on the front of the house. For the kitchen design, Dee David & Co. had a lot of great design ideas. Equally important to us was functionality. Over a few months of working together, we were able to come up with an overall design that was both functional and beautiful. With the additional space of the bump-out, we were able to add in a large island that has a pasta sink and bar with seating area. The island serves as a work space as well as a gathering space. The people sitting at the bar are in the kitchen space without being in the way. The design of the kitchen allows for good flow with separate working space for baking near the oven and cooking space near the range. There is also good preparation space in several parts of the kitchen. One of the odd spaces of the old kitchen was turned into a great walk-in pantry. A bookshelf was added for cookbooks. The new kitchen vastly improves on the lighting of the old kitchen. Part of the design was to add a cathedral ceiling. The lighting design added several types of lighting including under the cabinet lights, ceiling lights, and beautiful halogen spots. We are able to adjust the light for how we are using the kitchen. The design also makes use of natural light. The old kitchen had a large window overlooking the front garden. A bay window was added to the design as well as sliding glass doors replacing a solid door to the carport. 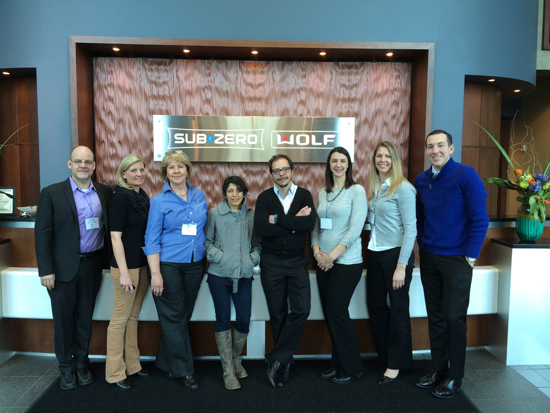 Early in the design process, Dee David & Co suggested we visit one of the product demonstrations at the Sub-Zero and Wolf showroom by Fretz. While a bit out of the way for us, we were very glad we attended. It gave us some great ideas for our kitchen. In the end we went with all Sub-Zero/Wolf products. We have the range with the built-in griddle and grill. Both the griddle and grill get weekly use. The grill has been a great asset for quick weeknight meals. Of course the double-ovens are exactly what I wanted. I use the proof and stone settings often. We also love the sub-zero refrigerator and have really enjoying have the wine refrigerator that has settings for both red and white wine. 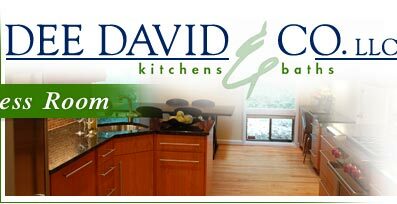 "We are completely satisfied with Dee David Co.’s remodeling of our kitchen. Dee worked with us for many hours helping us understand what we wanted, and helping us sort through a maze of design and product alternatives. Dee and her staff displayed meticulous care for details, and dealt courteously but firmly with our building contractor to ensure that the design was faithfully executed to her, and our, exacting standards." - Terence and Janice K.
"When we chose Dee and Company to be our contractor little did we know each of them would become part of our family. To say we are happy with the outcome of our renovation is an understatement, but one can see that when you enter the area. What you don’t see is the warmth, the caring and the great concern for their clients as the process unfolds. From beginning to end, they listened and totally included us in the process. They cared not only for us but for our animals, too. They are very aware of the little critters that can’t fend for themselves. Each day as we left for work we were confident that when we got home not only would we see progress but those that are near and dear to us would be safe. And one of the warmest feelings of all is that they are always there, even after the project is finished. A 10-year guarantee of one’s work is something that is unheard of, but Dee and Company stand behind all their work and products that they used in our home. Would we ask Dee and Company to be part of another project? Yes and we can’t wait. " "We wanted to let you know, again, how much we LOVE our home. While cooking dinner tonight it was amazing to have the space to spread out without having to negotiate where to set food vs. pans vs. us. The appliances, space, etc., are everything we wanted and make life so much easier. We had a group of friends over a few weeks ago and one of them walked in and stated how peaceful the place was. You really listened to what we wanted and helped us achieve that peaceful feeling, enhanced our view of the outside, and gave us a beautiful look on the inside. Of course we constantly tell the immediate world about all of you, your sense of style, creativity, listening abilities in getting to the root of what we wanted, and your impeccable timing of getting the work done, pretty painlessly." - Janice and Harvey B. "We entered the process of remodeling our 1956 kitchen with a limited budget and much trepidation. We ended up with a beautiful kitchen with our budget intact. Dee and her staff worked hard and creatively to help us stay within budget but have everything we wanted. Dee’s thoughtful design is matched by her knack of picking only the best people – both employees and subcontractors. The construction phase of the kitchen remodel was fast, easy and well-managed. There were extra, thoughtful touches along the way (a cleaning crew at the end of construction and a fabulous dinner prepared by Dee’s VP of Operations who is also a very talented chef) that proved to us that we were fortunate to be working with a terrific company. We look at our kitchen every day and can’t believe how fantastic it is." Washingtonian magazine and I visited her website. Her company was smaller and seemed more attuned to each individual project. She came to our home for a scheduled visit, and she absolutely promised us a beautiful kitchen that would fit our budget. We signed on as a customer and we have never been unhappy. Company size does matter! Dee David’s company started our renovation on time and they finished on time. All the work was professionally done and supervised on site every day by her project manager. Dee’s recommendations were always excellent, as she has a sense of style and she knows great design. Her carpenters are master carpenters, an essential quality needed for any renovation. There were no surprises, except for the beautiful kitchen! Are we pleased with the renovation? You bet we are." "Dee David and Company did an outstanding job managing the fluid process of getting our kitchen renovated. Dee and her team of energetic, highly competent and downright really nice folks transformed a kitchen that we thought was pretty okay into a space that we love every time we walk into it. A great deal of coordinating and trouble shooting went into making our renovation as quick and easy as possible for us. In fact, even though a construction defect from a previous contractor was uncovered during the process, final completion was delayed by barely a week due to the expertise of Dee's project manager. We're so pleased with the results of our kitchen renovation that we're looking forward to the day when we can afford to have Dee and her team get to work on transforming a bathroom that is badly in need of their skillful attentions." "We would like to thank Dee David and Co. for making our home a great place to live. Dee and her staff designed and totally renovated our kitchen and bathrooms with the help of some outstanding subcontractors. The result was both beautiful and functional. Dee has a real flair for creative design and solving design challenges. The design she created for us perfectly suited our needs and our particular sense of style. During the renovation, we never felt uncomfortable leaving home while work was being done—we knew that Dee’s project manager would make sure everything was as we left it and the house was secure. Dee stands behind her work, so you can be sure all material and workmanship meet a very high standard. We would without hesitation return to Dee David and Co. for our next major project!" "We, and those who visit our home, are absolutely astonished by the beauty of our kitchen. The effect of the glass tile backsplash, granite, cherry cabinets, hardware, high-end appliances and the design of it all is just inspiring. And not only is the kitchen beautiful, but every inch of the space is functional and practical and, so, has made every penny spent worth it. Dee David and Company did such an outstanding job on the design, construction and follow through - all the way to Hanne's gourmet dinner when the renovation was complete. You helped make our dreams come true and, in so doing, have increased the value of our home and our lives. Thanks to all of you - Dee, Hanne, David and Brian - for making our dream become a reality. We can't thank you enough." "Working with Dee David and Co, was a great experience. Frankly, we had heard countless horror stories about home improvement projects and approached the job with a certain amount of trepidation. Our fear was unfounded, however. From the planning and design phase through construction and the finishing touches, Dee and her wonderful staff made everything easy, and the result far exceeded our expectations. They finished the job quicker and for less cost than they had projected. More importantly, the finished product was everything we had hoped for and more. We would highly recommend this company!" "I loved every minute of my kitchen renovation with Dee. How many people can say that they actually had /fun/ living through (and with) major construction? Dee and her associates are knowledgeable, creative, dedicated, reliable and an absolute blast to be around. I can't count the number of times they all went above and beyond all expectations. On top of that, my project came in on time and on budget. Dee created the perfect kitchen and the perfect renovation experience for me." "Dee David and her competent staff did a great job of planning the remodel of a small kitchen for us that fully utilized every bit of space that we had and made it look gorgeous as well. She carefully considered and evaluated our use of every cabinet and counter to make them efficient as well as easy to use. We're seniors, and I find that I hardly have to bend over, or reach very high, in using our new kitchen on an everyday basis. And, after several years, it still has the WOW factor. Dee guided us in the selection of materials and appliances so that we didn't have to spend days and days pouring over the myriad of items that are available in today's kitchen market. She and her staff know their stuff and put their knowledge and experience to good use for the benefit of their client." "I just wanted to take the opportunity to thank you for helping us create the perfect kitchen and bath. Your recommendations of Plain and Fancy cabinets couldn't have been any more in line with our lifestyle and taste. They look as beautiful now as they did they day they were installed. It is amazing how well they have help up to the heavy use they receive, we only wish we could have fit more in the room. The same can be said for the final layout we decided upon. Given that our kitchen is an apartment kitchen, one of the things we wanted to maximize was its ability to handle two (or even three) people at once. Simply stated, mission accomplished! While the kitchen was the bigger of the project we had you design, the most commented upon, amazingly to me because it took so much less time to pull together, is the bathroom. I think I can best sum our delight with the bathroom project this way. Before the project, I used to look forward to traveling for work or on vacation so I can get out of our bathroom and take a good shower in a bathroom in which everything worked and was comfortable. Now when I am away, I cannot wait to get home." "To all of you, thank you for our wonderful new bathroom. It feels like we are in a hotel! We have especially appreciated the attention to detail, and clean-up. It has been a real pleasure working with all of you." - Lynn C., Bill S.
"Dee, Thank you for making my kitchen so wonderful to work in. Working with you, Hanne and David has been delightful." " Everyone who has seen this kitchen has been somewhat in awe of it. Yet I find it to be practical, useful, and convenient. I have just finished making 80 piroziki, using the new cookie sheets (remember my old ones?!) and the new oven. The piroziki turned out perfectly, all 80 of them, and I am not exhausted. Thanks to all for a great job beautifully done." "We admire our new kitchen every time we walk into it-it's functional, warm and elegant. It is thoroughly modern, and yet feels like it has always been park of the house. Dee understands how kitchens are used, and nothing is out of place. Her sense for design, materials, textures, and color is exacting. But just as important, Dee listened carefully to our ideas, negotiated her way around conflicts, gently steered us away from potential mistakes, and them improved upon our original ideas. Our new kitchen even better than we had hoped, and we are very happy customers." - Mark W. & Janet J. "Dee impressed us with her design skills from day one. The design we ultimately went with is nothing less than an optical illusion because the kitchen appears to be much larger than its true size. The entire team was exceedingly professional to work with - at every stage of the project they were accessible, informative and responsive. Down to most minor of questions, they were delightful to work with and we learned a lot through the process. They are extremely organized, knowledgeable, creative, and detail-oriented. From the cabinets to the counters to the appliances and many special features, we are thrilled with our new kitchen. Dee David and Company exceeded our expectations and we are grateful for all the did." 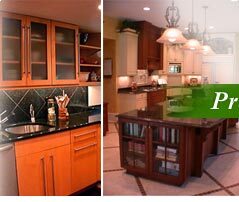 - Beth H. & Paul S.
"It was seven years ago that we began the remodeling of our kitchen. It is still giving us much pleasure. Everything you designed has been just right -- wonderful design, excellent materials, and even the construction phase was fun! After that you remodeled our downstairs powder room, and two years later, both upstairs bathrooms. So--we have nothing more to remodel! I almost wish we did, it was such a pleasure working with you." “I’m still amazed when I stand in the middle of my new kitchen and I continue to LOVE it! You’ve been wonderful and your team has certainly made our renovation a “smooth operation”- Thank You. "On a scale of 1 to 10 Dee David and Company are an eleven! We felt an incredible rapport working with Dee on our kitchen design. Now that our kitchen is done we couldn't imagine a more intelligent layout and selection of features. We were hoping for a "wow" kitchen, and with Dee we got it." - Anne and Walt G.
"We can't say enough good things about our experience with Dee David & Co. We just finished a kitchen remodel that included an addition of our existing kitchen and dining room. From the very first meeting with Dee, she responded instantly to what we were trying to achieve and came up with a design that suits us perfectly. As the project progressed, we were always kept well-informed and any questions we had were handled promptly from anyone in her office. We LOVE our new kitchen and look forward to working with Dee and her staff again in the future when we tackle our bathrooms. Thanks again!" - Paul and Terri C.
"To say I was pleased with the kitchen and master bathroom renovations undertaken with Dee David and Co. would be an understatement. You need only look over the images of these two rooms here in my North Fairlington condo to be persuaded of their thorough commitment, professionalism and heightened sense of perfection to virtually every detail of the planning and execution of these two projects. Add into this mix a sense of style, humor and an engaging group of personalities and you've got a remodeling experience that was -- for all the short term transition it entailed -- actually fun! An upstairs neighbor actually said: "If I had a kitchen that looked like this, I'd be sleeping in it." And the experience of taking a 1st shower in the openly designed glass shower....well, I'll leave that to your imagination."